Sherry Fitzgerald is offering No 182 Ros Caoin to the market for sale by private treaty. 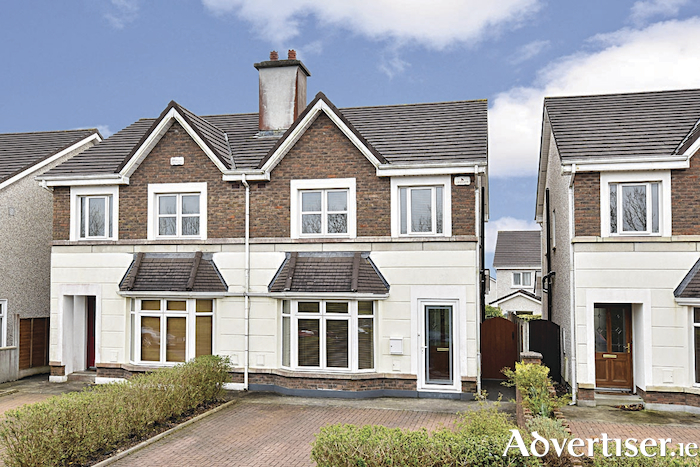 This is a truly impressive three bedroom semidetached property. Ros Caoin is a quality housing development built by O'Malley Construction in 2003 and this owner occupied dwelling is presented in excellent decorative order throughout. Ros Caoin is a well thought out scheme on the doorstep of Galway city, located close to the Galway Clinic, Merlin Park Hospital, and the Galway Mayo Institute of Technology. It has easy and convenient access to the principal national routes to Dublin, Limerick and the west with the M6/M17/M18 motorways accessible within a few minutes’ drive. With an asking price of €280,000, the property boasts a large living room with gas insert fireplace and bay window to the front, with kitchen/dining room to the rear. Each of the three bedrooms is complete with built-in wardrobes and there is an en suite to the main bedroom, along with the main bathroom on the first floor. The BER is C2. All in all, this is a lovely home in a perfect location and a viewing is highly recommended.